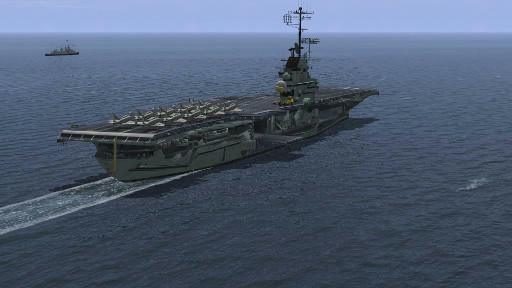 For your enjoyment I present a complete model of USS Bon Homme Richard CVA-31 circa 1965. I have added much detail -especially in the regions seen from your cockpit. 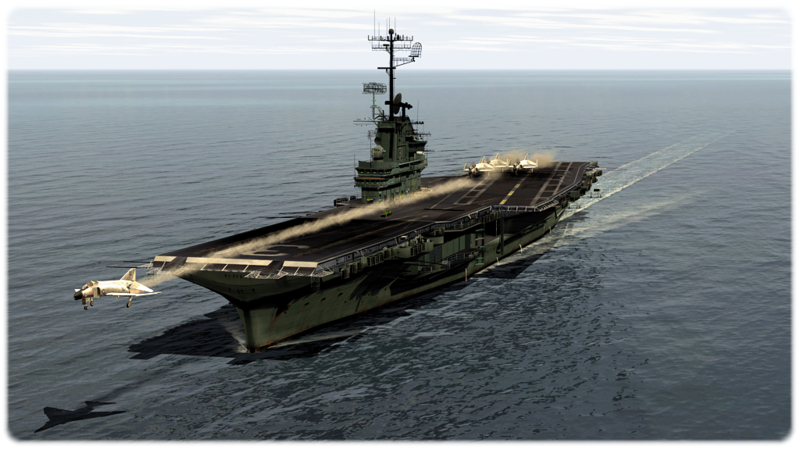 The aim was to create a high detailed model for the navy pilot and it is hoped that many of you will use BHR as your home base. Bon Homme Richard was an Essex class attack aircraft carrier launched over 70 years ago and fought honourably in World War II, Korea and Vietnam. Highly detailed model with high resolution, weathered texturing. 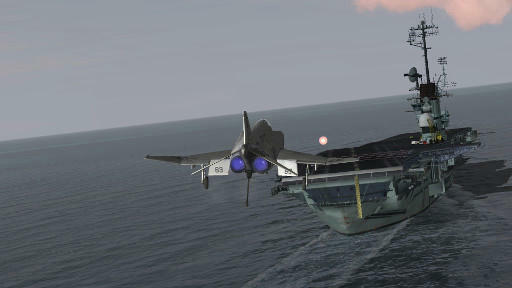 Among other things it has: detailed flight deck crew, alternative low resolution crew, flight deck vehicles, fully modelled animated radar mast, alternative aircraft parking, optional replenish at sea, optional elevator positions, sponsons equipments details, extensive railing, whalers, optional night deck lighting, curved deck antennae, jet blast deflectors and more. The emphasis was on detail. There are no plain surfaces, all objects were mapped with textured areas to give variation in hues and tones. 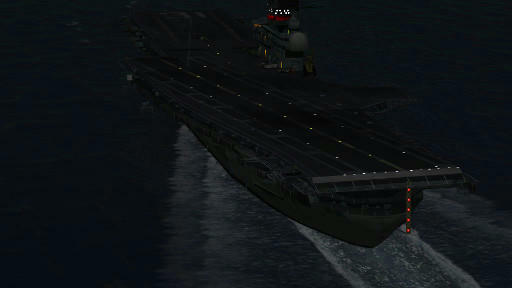 Practically all damage models and textures have been removed and only flight deck area collision boxes were created. This was a logical step to save memory, time and to achieve a higher visual realism. The model is intended to be used in plausible scenarios and shell damage, colliding into hull or masts is considered to be a fiction. Smoke and animated flags were also excluded for similar reasons. 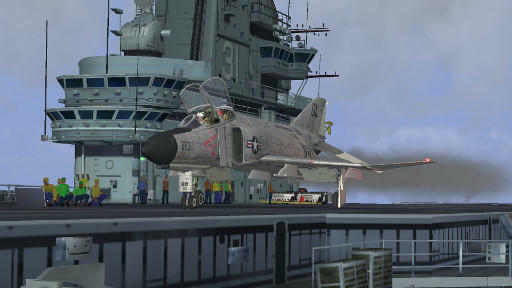 F-4D Phantom II BHR and A-4M Skyhawk BHR detailed skins are included to complete the boat. A lengthy readme file is included. 1) First, ensure that IL-2 is running and ready under 4.12.2m. That is, Modact, Engine MOD and Common Utilities are installed. 2) Add western's Ship Extensions. You will also need to install western's mod (version 20150114 or latest) for Engine MOD. 3) Install the amazing High Resolution / True Color Textures Mod package by Carsmaster and Storebror. 4) Unzip 'USSBonHommeRichardCVA31_1965_vxxxx.zip' file to a temporary location. 5) Copy and paste the unzipped 'USSBonHommeRichardCVA31_1965_vxxx' folder to your .../Ubisoft/IL-2_1946_4122m/#SAS/ mods folder. (IL-2_1946_4122m - or whatever you call it - is a separate installation of IL2 version 4.12.2m). All IL-2 installations are best kept separate from .../Program Files/... folder. 6) Open .../Ubisoft/IL-2 1946_4122m/#SAS/STD/com/maddox/il2/objects/ships.ini with a text editor. Add all the lines from "ships_ini.txt" at the end of the Ships.ini file. 7) Open .../Ubisoft/IL-2 1946_4122m/#SAS/STD/com/maddox/il2/objects/stationary.ini with a text editor. Add the line from "stationary_ini.txt" at the end of the US warships section. 8] Open .../Ubisoft/IL-2 1946_4122m/#SAS/STD/com/maddox/il2/objects/chief.ini with a text editor. Add the first line from "chief_ini.txt" after the US warships section. Add the second and third lines in the other US warships section further down in the Chief.ini file. 9) Open .../Ubisoft/IL-2 1946_4122m/#SAS/STD/i18n/technics.properties with a text editor. Add the single line from "technics_properties.txt" after the US warships section. 10) Installation of the catapult mod is almost mandatory. Open .../Ubisoft/IL-2 1946_4122m/#SAS/!SAS_Engine_Mod/com/maddox/il2/objects/catapult.ini with a text editor. Add the lines from "catapult_ini.txt" to the end of the catapult.ini file. 11) Use FullMission Builder to create a scenario containing Bon Homme Richard. 12) Have loads of fun. 13) If you have FPS issues, follow the no-crew option in the readme. 14) It is possible to use the carrier in other IL-2 versions, but not recommended. Install western0221 SCB-125 carrier pack from http://www.sas1946.com/main/index.php/topic,24177.0.html?PHPSESSID=5cb3fd69d58e51a842cf6bb5d06f12f6. Follow his instructions. 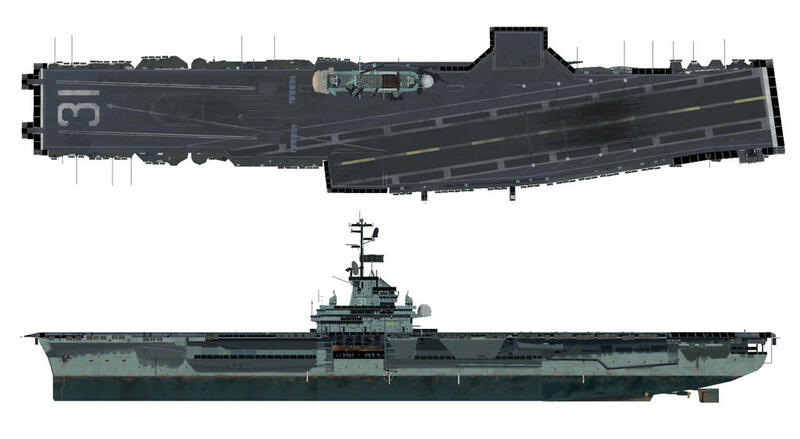 Select one of the carriers and remove all the data from the ...3do/Ships/carriername folder and replace with the corresponding Bon Homme Richard data. Open the .../STD/com/maddox/il2/objects/ships.ini file and find the appropriate "carriername" and edit the details to reflect those in the "ships_ini.txt" file. That is, remove most of the guns, add in radar and sequentially renumber all the parts headings in square  brackets. The jet blast deflectors will not work in these installations. For example, use USSEssexCV9_1957 as the proxy for Bon Homme Richard and replace the 59 parts in the 'ships.ini' file with the 17 parts given in the 'DBW_HSFX_UP.txt' file. Your terminal or logfile will show you what you did wrong; it may take a couple of iterations. Don't change the old "carriername" and when you use Full Mission Builder, "31" should pop up in its place. JBDs are now working - thanks to western0221 - and are included in version 150731 onwards. For those who don't want to download and re-install the whole ship, a patch may be downloaded from MediFire http://www.mediafire.com/download/yme9t6czxlm0jx6/CVA31_JBD_fix.zip (If you use any options (meatbal, parking, replen etc) don't forget to modify the JBD entries in the relevant hier.him file). Thanks for this release....the work I see behind her was simply immense....as immense as our grateful thanks to you and all the mates behind this project! Thank you Karla! She is a thing of beauty! Excellent work! Thank you! But ... what can be caused by this error? ... Add western's Ship Extensions (for working jet blast deflectors to be added later). @deSAD - I think you've identified the problem. It looks like the 'setBlastDeflector' bit gives us a clue. Install western0221's Ship Extensions which is probably necessary even though BHR JBDs aren't fully working yet. I'll amend the installation instructions. Please let us know whether its fixed to confirm that the problem and solution are understood. are much much recorded in my log.lst. In IL-2 1946's 3D graphics engine, One LOD in One msh file can have only 3000 faces. So a part of your ship is over this limit. Please search the part and separate into two (like 2000 faces + 1444 faces) msh file. @deSAD - I think you've identified the problem. ... Install western0221's Ship Extensions which is probably necessary even though BHR JBDs aren't fully working yet. I'll amend the installation instructions. Please let us know whether its fixed to confirm that the problem and solution are understood. Yes, after installing western0221's Ship Extensions problem has been resolved, and try to play a mission involving the ship no longer results in an error. 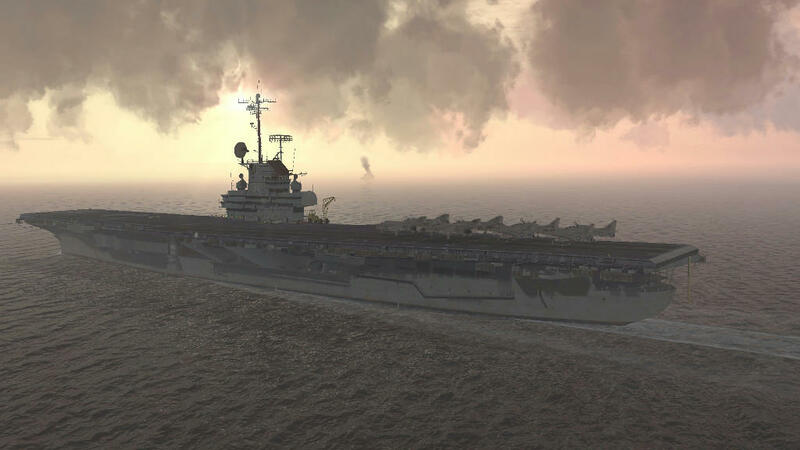 Underway relenishement may be simulated by renaming the "Hier.him" file in .../Ubisoft/IL-2 1946_4122m/#SAS/USSBonHommeRichardCVA31_1965_vxxxx/3do/Ships/USSBonHommeRichardCVA31_1965/ folder to "Hier.him_KEEP" or similar. Copy, paste and rename the "Hier.him_unreplen" file to "Hier.him" in the same folder. Open .../Ubisoft/IL-2 1946_4122m/#SAS/STD/com/maddox/il2/objects/ships.ini with a text editor and deactivate the three lines in [USSBonHommeRichardCVA31_1965:Part18] by adding "//" at the beginning of each line (or delete the lines). In Full Mission Builder positon a suitable tanker on the starboard side of BHR using high zoom to position the tanker accurately. Make sure all ships proceed at the same speed. The hoses are not flexible - so allow for the lack of realism here. But this section - [USSBonHommeRichardCVA31_1965:Part18] - absent. The last section - [USSBonHommeRichardCVA31_1965: Part17]. Tell me, please, is a misprint in the manual or implied, that the future model of the ship will be further developed? Thanks deSAD. Bon Homme Richard looks nice and crisp on your system. I see, like me, you prefer aircraft parking near stern to give a lengthy taxi run to catapult. 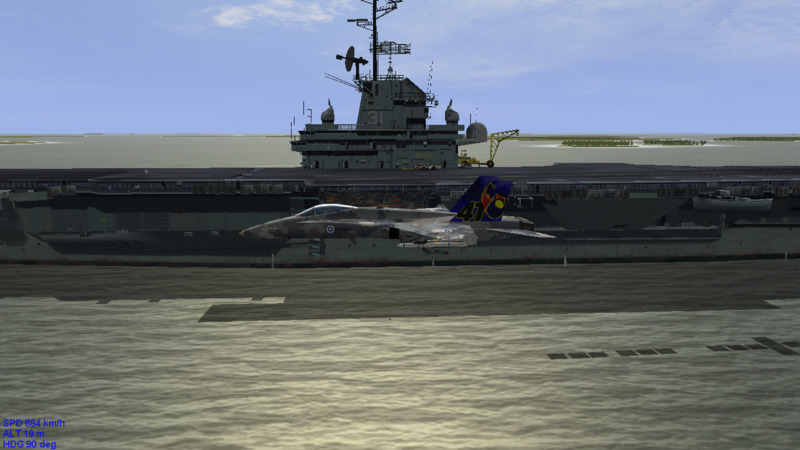 It would be better if we could park along deck edges facing inward - in fact I will ask in the Making Mods forum. There is an error in the read.me for underway replenishment installation. Ignore the changes to the ships.ini file. I'll update soon.